new items available on our Count To Four Etsy Shop! Since Prabh wore this sweater on this blog it was a hit! Therefore my mom knit another one, a complete replica of it! Perfect for the winter, not only is this sweater warm but it's stylish as well, with details along the sleeves, neckline and bottom of the sweater. As seen in the photos it can be worn in many different stylish ways! It will definitely keep you warm in the cold. 1. dark days are coming, grab your sweaters! 2. when it rains, it rains things to do! Warm and practical studded knitted fingerless gloves. With the trendy copper and gold studs detail these are a perfect fashionable finishing touch on your outfit for the winter. Keep your hands warm, but still have the ability to do things with them, such as writing or taking photos. Our shop was featured on HauteCanada's site! The studded gloves looks awesome! Bellissimo il maglione (: Reb, xoxo. studded gloves rocks! love them so much! I love those fingerless gloves - too cool! i have the same hand warmers(made by me) minus the studs though. love them. the sweater looks so comfy. love the color. 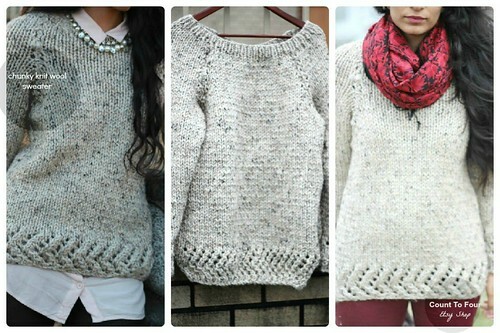 Gray sweater is super stylish and nice!